Behold the muffin: palm sized bit of goodness. Sourdough Oatmeal-Raisin Muffins feature a tender interior studded with dots of dried fruit and whole-grain wholesomeness with a delicate sourdough tang surrounded by a sturdy outside. They're easy to eat, nutritious and beloved by youngsters and oldsters alike. Okay, yes, they have some sugar, but if you compare them with cookies, its so much less. Why don't we fix them more often? They are simple to make requiring only a bowl and a wooden spoon plus a few measuring utensils. Don't you love the scent of bread baking? That's the bonus! The true benefit is that palm sized bit of goodness, still warm from the oven and tasting just lovely. 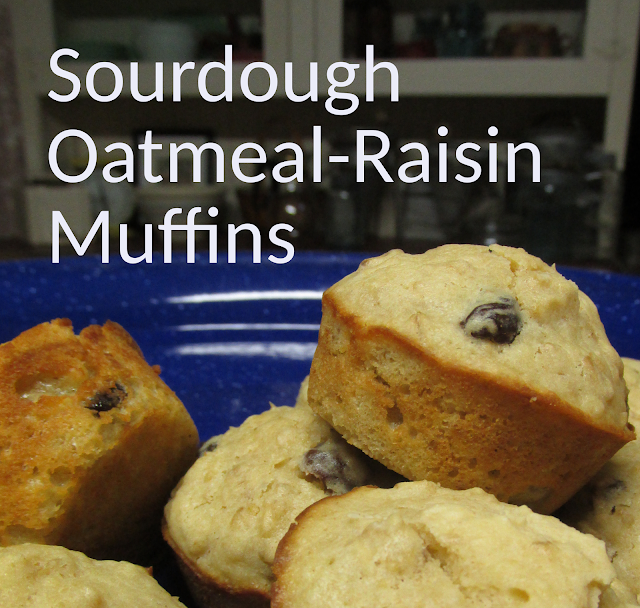 Dates are really good substituted for the raisins. If this recipe makes more than you need (it makes 18 muffins) you can store the dough in the refrigerator and bake more the next day with good results. I have also frozen muffin dough in cupcake liners and baked them frozen for 25 minutes and that worked well. Freeze in muffin tins and then remove frozen dough and place in a freezer bag. I like to refresh my sourdough by adding equal amounts of flour and water an hour or two before using. It's not absolutely necessary, but the sourdough seems more "active" when refreshed. You might consider letting your muffins rest in the tins for 15 minutes before baking if using sourdough that has not been refreshed. You can find a printable version of this recipe at Tasty Kitchen. Soak oats in milk for an hour (or leave in the refrigerator overnight if that works better). Muffins are so forgiving! Even this ungraceful application comes out yummy. Prepare muffins tins by spraying with cooking oil or fitting with liners. Fill muffin tins 2/3 full. Bake for 15-20 minutes or until lightly browned. There is lots to love about muffins. Enjoy! Like many of my sourdough recipes, this one is based on one found in Sourdough Cookery by Rita Davenport. Thanks for the wonderful recipes, Rita!